This month's theme is The Seasons. In today's world, that makes us think of falling leaves, spring flowers, long, hot lazy summer days, and at this time of year, homey holiday traditions. But one thing I've learned from writing in the medieval time period is that for those folks, "the seasons" were not a pretty landscape to be viewed from a cocoon of heated (or air conditioned) comfort. Each new season was literally a matter of life and death. Will there be enough rain? Too much? Will the harvest be abundant or will we go hungry? Many of our pleasant, seasonal celebrations have their roots with our primeval ancestors as they gave joyful thanks or tearful entreaties to the gods during the change of seasons. I discovered one of these as I researched my upcoming Scottish-set release, HIS BORDER BRIDE (May 2010). The celebration that evolved into "May Day," with its seemingly innocent dancing around the May pole, had origins deep in pre-history. Like so many of these things, no one can quite pinpoint where, but similar commemorations of the return of summer were held in Ireland, Scotland, Germany, and Sweden. It is worth noting that Beltane/May Day is exactly six months before Samhain/All Souls Day/Halloween. They open and close the fruitful, summer season. Both feature hilltop bonfires and, at both times, the veil between world of humans and spirits is supposed to be particularly porous. In Scotland, the May holiday was called Beltane--or Beltaine or Bealltainn or any one of a number of other variations. Each area had its own traditions and in the course of history, the date has ranged from April 30 to May 1 to the first full moon after May 1 to the blooming of the rowan. It was an outdoor celebration, with bonfires lit on hilltops. As civilization grew more crowded, that meant you could see your neighbor's fire, no doubt a reassuring sight. The common themes were fire, the return of the summer sun, and the rebirth of fertility. This meant prayers for abundant crops and agriculture. It was also the time of putting livestock back out to summer pastures and this was a key part of the celebration, as the animals were driven between two bonfires for good luck. But it also meant human fertility. A Queen and King were chosen to represent the Goddess and God and after the bonfires were lit, celebrations continued all night. Given that it was a fertility festival, the "celebration" apparently produced a Beltane baby-boom nine months later. The return of the summer sun was symbolized by the return of fire. The night before, all fires were extinguished. Then, as the sun slipped below the horizon on Beltane Eve, a new, sacred, "needfire" was lit. If this sounds like a symbolic nicety, think again. This pre-dates matches. Man did indeed need fire in order to live. Without a flaming brand or candle to light the wood, how could man start a new fire? Rubbing two sticks together? In some of the older traditions, there are reports of great wheels being built and the men all running together to turn them fast enough to create enough friction to start a fire. Regardless, faced with this monumental challenge, the community needed all the gods' favor to bless their efforts. To insure it, comes another aspect of the tradition, more sinister and less enjoyable than the celebrations of fertility. As part of the ritual, a "Beltane" cake (or bannock, a small oat bread) was passed. One piece was marked and the one who got it was called the cailleach bealtine for the evening. This is described as a term of "great reproach." The unfortunate man left holding the marked piece was shunned, or "treated as dead," for the evening (longer in older traditions) and even swung towards the fire as if, well, as if to be a sacrifice to the gods. Which, no doubt, used to be the case. While the exact rituals performed under the Druids or the Celts are lost, the celebration continued not only during my 14th century setting, but into the 19th century. Charles Dickens wrote of the remnants of this tradition as it was observed during his lifetime. Today, in Scotland, Beltane lives on. In Peebles, they've moved it to June and incorporated it into a "riding," or Reivers celebration. 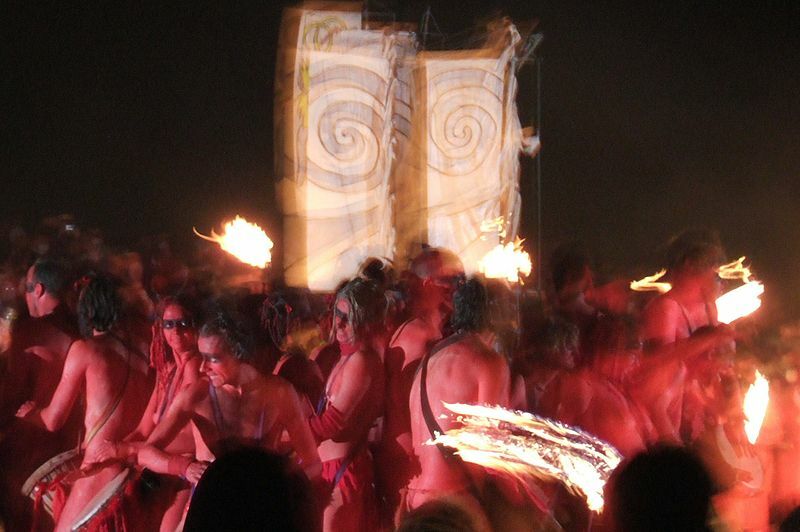 The Beltane Fire Society now organizes a huge event in Edinburgh every April 30. Though it incorporates many aspects of the old traditions--queen, king, fire, symbolic death--the Society does not claim to be recreating, but reinterpreting the holiday.